With all the hype surrounding the release of Twilight, I was looking back at one of the videos I've ripped off when I noticed an update on one of the sites I frequent for the latest tidbits about the movie. That site is MTV.com. Known to most Twilighters for its Twilight Tuesdays segment and Twilight Dad Larry Carroll, it also featured one lucky fan named Laura Culpepper who became an intern/correspondent that covered some segments as part of the MTV Movie Awards pre-show activities last June 2008. Her conversation with Robert Pattinson (yes, conversation; their interaction doesn't feel like an interview to me) is by far my favorite among the slew of press releases as it was candid, funny and heart-warming in spots. So imagine my surprise when they got to bring her back to talk to Robert again, and the interaction is just priceless. I feel that they've somehow managed to "imprint" on each other as they act more like close friends. To think, it has been more than five months since their first meeting. I'll be showing the before and after interviews of the guest blogger/intern. Two notable differences: the hair and the seating arrangements. Enjoy the videos! Credit goes to MTV.com. I know a million girls would trade for her spot (including me, of course). However, I've got to give props to her because she handled herself and both interviews well. Even during the Movie Awards coverage. She's obviously a fan but I never saw her flip, gawk or stammer. She laughs nervously at times, but who wouldn't be? Her questioning skills may not be Pulitzer-worthy but she's able to draw out things from Robert Pattinson that I think no one else does. And that in itself is a gift. For Laura, it's an experience of a lifetime. I hope she gets to do more of these kinds of interactions with Robert Pattinson in the future, once (and hopefully) Summit formally greenlights on the sequels. Now that's a progression I'm looking forward to seeing. I was debating whether or not I should do this. But you only get to live once and I've promised a couple of people that I'll post a portion of it. Doing this is like free fall for me. I'm anxious about it but I'm equally curious to see how my writing fares. For a long time, the things that I wrote were mostly poems and some short stories. Lately, however, I've been dabbling on fiction writing. I never realized how invigorating the experience feels. To date, only one person has seen what I've written so far and she's badgering me to finish it. I don't know why. I will not share my tale as to how and when this came to me. At least for now. Although I hope that someday I get to finish this tale and eventually have it published. Selecting what to publish here was challenging as there are so many ways you can go to preview a story. I have a couple of titles that I'm playing with but I'm not comfortable using any of it yet. Well, without further ado, here goes my free fall dive. I promised only a portion but do tell me what you think. Enjoy. To anyone’s eyes, it would seem like an ordinary day in the National Statistics Office due to the long cues of people. It would have looked terrible but already, ten million customers were served as seen from the overhead display that updated real-time for every completed transaction. The only time you realize that there was a difference is when you see how they were getting the information they needed. Everyone was holding a slim, translucent plastic half the size of a typical credit card. Each individual went inside one of over a thousand booths set-up on the floor to update their info. Usually, this process can be done in the comforts of their home. However, with the announcement of a minor glitch in their system, everyone was prompted by the government to renew as a precaution. Compliance was a must. I took a quick glance at one guy who was reading today’s paper on his ultra-lightweight, tablet PC. He moved his hand over the screen as if to turn to another page. I saw the three-dimensional hologram flip over enough to catch the date before it disappeared from sight. January 1, 2108. I got wary of the date. It felt like lead to me. I didn’t come to renew my information although I had the same plastic in my hands, a futile attempt to blend in. The whole process was unnecessary for me. I walked further past the renewal booths until I found what I was looking for: the archives section. Although I already knew the answer to what I was going to do, I still went in to satisfy my curiosity and my longing. I sat on one of the inquiry tables inside, located a few feet from the door. The section didn’t get a lot of guests so Gio, the attending clerk, sat straight up the moment I took a seat across his table. “Good morning, ma’am! How can I be of service today?” He asked. “I’m looking for some information about a person.” I replied. “Sure. Give me five seconds to draw up the system for you.” Gio straightened up his seat and moved his right hand, palm facing the 29-inch slim monitor perched upon his clean, wire-free, black fiberglass table. “Ok, it’s up. Name?” He asked. “Elysse d’Loire Austria.” I said, feeling strange saying my old name aloud. It has been a while since I used or been called that name. “Um… May 21, 1977.” Saying it felt even stranger. “George Francisco Austria and Elaine Martinique d’Loire.” I said almost sadly. Gio waited patiently as the computer drew up the search. He didn’t type over his paper-thin keyboard. The voice encryption feature of the system picked up on his questions and the details I mentioned. I could see a frown forming on his forehead 15 seconds after I uttered my parents’ names. He maneuvered his hand across the screen, as if he was flipping cue cards. I knew that he was quickly reading page after page of results. Pages of an old life. “Hmmm… This is strange… There is a George Francisco Austria and an Elaine Martinique d’Loire in our database but no Elysse d’Loire Austria.” Gio moved his fingers on the screen, flipping on everything his research turned up on. “Are you sure?” I asked in a rhetorical fashion. “But they do have children right?” I probed further. At the very moment, I wanted to say yes. I stopped myself from doing so despite feeling a hollow pain beneath my ribs. “Ok. Do you have a chip with you so I can upload the data?” He asked. “No, it’s okay. That won’t be necessary.” I said. I slipped through the doors faster than how I went in. Whether or not Gio noticed, I didn’t really care enough to the point that I didn’t see someone who nearly blocked my path, her cherubic face crinkled in disgust and frustration. “Gem, you shouldn’t leave me like that… You’re supposed to be training me, remember?” She scowled. Normally, I would’ve scolded such kind of behavior as she was nearly shouting. But no one really noticed or heard it, simply because no one could see us anymore. We both disappeared into thin air the moment we crossed paths. “Sorry, Lexi.” It was all I could say at the moment. I merely breathed a sigh to answer her. “Hey, are you alright? Looks like you’ve seen a ghost.” Lexi inquired curiosity raging in her eyes. “No, I’m okay. So where were we?” I replied, quickly dismissing my thoughts. “My training. We’re supposed do be doing something simple today?” Lexi asked. “Right. So have you seen what you need to do?” I asked. “Yes, and she’s about to leave now. If I don’t get there in time, the fate of a future president will be in jeopardy.” Lexi said anxiously. “No need to worry. You have plenty of time to do what you need to do.” I replied. The both of us went out of the building. We re-appeared from thin air without so much as being noticed by anyone who was within the same area. Lexi saw her target and waited for the right cue. I stopped to wait from a distance as Lexi swiftly moved to pick-up the woman’s wallet just before she was about to sit on the passenger seat of her 4X4 hydrogen-powered SUV. “Ma’am, you dropped your wallet.” Lexi mentioned. “Oh, thank you, sweetheart!” The lady said, obviously in a hurry to board her car. However, Lexi was persistent. Good, I thought. “I’m sorry, I couldn’t help but recognize you. Are you Monique Aguinaldo?” Lexi asked. The woman looked flustered at the recognition and immediately placed her hand on her growing tummy. Ah, the future president, I mused. “Have we met?” Monique politely replied. “No, but I do recognize you. You’re much beautiful in person than in Tatler.” Lexi started to work on a chit-chat with the woman who was obviously getting irritated by the second. “Patience Lexi.” I communicated to her in my thoughts. “I know, Gem. You taught me well. It’s about time.” Lexi replied without turning her head towards me, while she continued her chit-chat with Monique. All of a sudden, a flurry of commotion happened outside. Every single person were screaming for their lives as I heard a loud blast. Within that same moment, Lexi swiftly tucked Monique in the passenger seat, closed the door and glided back towards me. A broken bus door came through the air and landed on the ground where Monique stood nearly seconds before Lexi safely put her inside her SUV. The commotion didn’t stop and we disappeared again from everyone’s sight. Both of us didn’t wait long enough to see Monique asking her driver to roll the vehicle forward in order to thank Lexi. We just moved outside to appraise the wreckage. Lexi saved one life in exchange for a hundred people who died and several who were injured by a bus that lost control along East Avenue in Quezon City. “Hmm… That was cool. I don’t feel a thing now unlike the first.” Lexi declared while she was creating two small hurricanes with whispers of her breath and placed them underneath her feet for her to float. I wish I could’ve reacted otherwise but after a hundred years of doing it, the deaths grew numb on me. I stretched my shoulders until a pair of feathered white wings twice my size appeared effortlessly on my back. I flew towards the middle of the wreckage. Fires were still eating up the bus but I hardly notice or felt anything. Not that I could, really, since I was never bound to this material world. I went in the middle of a growing crowd of luminous souls, those who died or about to but were ready to pass on. Using my right index finger, I drew an invisible line in the air and a stairway opened in front of me. Each of the souls ascended through the stairway where Peter and Judas were waiting for them to do the sorting. As the last of the souls ascended the stairway, I blew on the door and it closed immediately but not before Peter offered a kind smile and Judas winked at me. Lexi laughed. I pretended not to notice. "Dave Petrakis is my new hero." In the indie movie Speak, Melinda Sordino (played beautifully by Kristen Stewart) was in awe of Dave Petrakis' courage to speak out his disappointment in Mr. Neck's classroom wherein he forces students to conform to his preferred teaching dynamics. Dave Petrakis is played by Michael Angarano whom I remember most for being Elliot (Jack's son) in Will & Grace. I was laughing my head off the first time I saw Robert John Burke in Gossip Girl as Bart Bass because he played Mr. Neck in this film. It was hard for me to differentiate Mr. Neck from Bart Bass and vice-versa because I hardly saw the difference; he was acerbic in both roles. While it would be a neat trivia to share that Speak is where Kristen and Michael developed their real life romance, my blog post isn't entirely about this movie. It's merely a backdrop. I do admit, however, that the movie and quote above did inspire me to make this blog. Hopefully it'll make sense to you why I chose that title to characterize my post after you finish reading this. 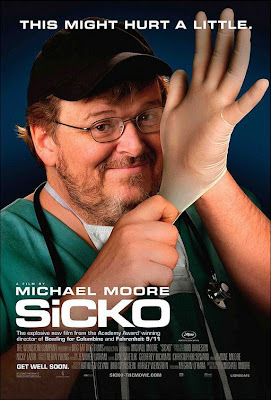 Just a few hours ago, my brother and I finished watching one of Michael Moore's controversial documentaries entitled Sicko. I have a weird relationship with documentaries. For some reason, I find it rather hard to finish one because I always end up either being grossed out or terribly sad. That applied to Morgan Spurlock's Super Size Me. It's not that I don't want to hear the truth about things. It's the attachment I develop to discovering such truths scare me. For me, documentaries are like a slap in the face -- they really drill it on you that we're living in dangerous times, that this is not the best world to live in. It has the tendency to develop paranoia in people. I have long accepted the fact that these are difficult times but I'd rather keep an optimistic/pragmatic view on things. Imagine living your life being on guard 24x7, always laboring in fear of what will happen the moment you shove a French Fry down your throat. Will I die in a minute because of one small indulgence? However, I'm making an exemption for this documentary because it deals with an issue close to my heart -- health insurance. For any corporate employee, health insurance is a big thing especially if your monthly salary -- after taxes, of course -- can't pay for premium health care. It was one of the main reasons why I accepted my current job because it afforded a good health insurance package for me and my parents. It's not absolutely stellar but it'll do especially since doctor consultations are expensive, even the tests and the medicines that follow after. Michael Moore's documentary exposes the state of health insurance in the United States. To sum it up, it's a profit vs. people issue. I was shocked to find out that accessibility to good health care is a problem. The list of pre-existing conditions alone was unbelievable. Stories of people who suffered from the system were featured; most of those stories didn't have happy endings. Loss of lives happened due to health insurance companies refusing to cover medical expenses. Even the simple non-declaration of a yeast infection caused one health insurance company to drop one of it's beneficiaries. Sure, maybe the person forgot to declare it. To err is human. But to drop off from the insurance completely and force the person to pay back the company because of this small thing? I have no words. There were shining moments in Michael Moore's documentary but none of them are found in the United States. These are triumphs in Universal Health Care wherein countries like Canada, United Kingdom, France and even Cuba (!) were featured. People in those countries, rich or poor, didn't pay for anything. Their governments take care of all medical expenses: from consultations to tests and medicines. Even compensation for women on maternity leave! My love for Europe grew ten fold at the end of the documentary and made it more sensible to be the continent where I would work if I choose to go the overseas route. I was in tears when four 9/11 New York firefighters got free medical consultations, tests and treatments in Cuba of all places; they were even accorded a heroes' treatment by Cuban firefighters. Sicko makes you wonder what has happened to the country they call "The Land of Milk and Honey." Now, I fear for my friend who's migrating to the US with her kids in about a month to join her husband. How would they be treated there? "Michael Moore is my new hero."